They were supposed to be this year's hottest holiday gift - but it seems that hoverboards are making an increasingly bad name for themselves. 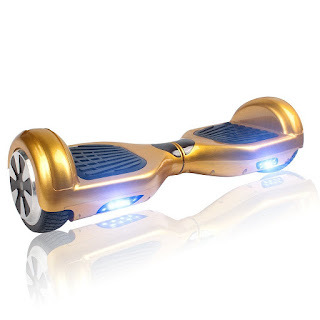 Costing anywhere between $200 and $2,000, customers have complained that the boards - which don't actually hover but are propelled by wheels - are prone to catching fire. Now, U.S. airlines Delta, American and United have all decided to ban the devices from both carry-on and check-in luggage over fears they could burst into flames mid-flight. The announcements today mean that three of America's four largest carriers have now outlawed the boards from being taken on to their aircraft just in time for the holidays. The fourth airline, Southwest, still allows customers to pack the boards on in carry-on, but is thought to be considering a ban after a spokesman said the company is 'discussing the topic further'. United said its ban will take effect immediately, while Delta's ban takes effect Friday, and American's on Saturday. Smaller carriers such as Alaska, Virgin America, Hawaiian, Spirit and Allegiant have already barred customers from taking hoverboards on to their planes. The news will likely come as a blow to thousands of festive flyers who have the item as a gift and were hoping to take it with them to see relatives. While the exact cause of the fires is not known, users have reported that the boards started burning while on charge or being used. That suggests the fault lies with their lithium-ion batteries, which can overheat and cause fires. Millions of devices, from laptops to phones and e-cigarettes, are fitted with the batteries which are preferred to older nickel-cadmium units because they are more powerful, last longer, and do not develop a 'memory' if not fully charged each time. While the batteries are perfectly safe if undamaged and wired properly, there is concern that some hoverboards are being manufactured incorrectly, leaving them at risk. Good quality devices have special circuits that prevent the batteries from overheating or being overcharged, dramatically reducing the chance of catastrophic failure. However, poorly manufactured, non-branded units, often from China, usually do not have these additional safety systems. Also, if a lithium ion battery is damaged, it can short-circuit and lead to a meltdown. So it is very important that the battery is properly protected. A poorly manufactured battery can undergo a 'thermal runaway' - where a simple malfunction causes head inside the device to increase exponentially, leading to a meltdown. The Federal Aviation Administration has urged airlines to tell passengers not to pack spare batteries in checked bags because they can ignite and cause a fire in the cargo compartment. Once one battery catches fire, that can cause batteries in surrounding devices to overheat and burst into flames as well. More than a dozen airlines around the world have stopped accepting bulk shipments of lithium-ion batteries over fears of fires. Electrical fires are difficult to extinguish, requiring a blanket or CO2 extinguisher rather than water, and emit toxic fumes which can damage the lungs. Spokeswoman Patty Davis called it a high-priority investigation because of the scooter's popularity.